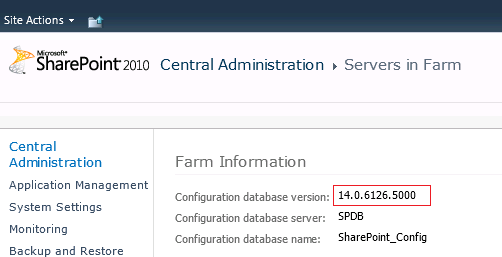 You might want to know which patch level my SharePoint 2010 Farm is especially when you do some migration stuff from DEV/STAGING to PRODUCTION or creating a new environment based on PRODUCTION. Note the Configuration database version as shown in red box. Browse http://www.toddklindt.com/blog/Lists/Posts/Post.aspx?ID=224 and find that configuration database version in above site you will patch level description.